You can fix your own credit without paying someone else to do it for you. All it takes is patience, tenacity and loads of paperwork, this will take you do a better credit score and the best do-it-yourself feeling around. Credit repair isn't difficult, however, let me first start off with a few items that can make your situation more difficult. 1 » Failing to dispute issues with Credit Bureaus - Writing letters to dispute with the three credit bureaus is the best way to knock off up to 20% of the items you are disputing. If the credit bureau can't verify the claims, they have to remove them. 2 » Failing to document your work - You should be keeping notes on everything, who you sent a letter to and when, who called you and when. You want to send all communication certified mail to register when they received the letter as this is the countdown for the 30 day dispute time-frame when you are writing to the credit bureaus. If you don't hear from them in the 30 day window, then they MUST remove the item per the Fair Credit Reporting Act (FCRA). 3 » Failing to dispute via snail mail (letters) - NEVER dispute online, you do not get any record of the dispute for when they received it (certified mail you do). You will not be able to dispute specific items within the line, such as a wrong high balance, wrong date account was opened, etc. You will not be able to send documentation to back up your disputes either. 4 » Don't be unrealistic and Don't give up - There is no quick fix to cleaning up a credit report and bringing a credit score up. It can easily take 6 -12 months to see progress being made. Along with that it can seem almost impossible to remove items such as bankruptcies, tax liens, and judgments. Even though it may seem overwhelming at first, take it one step at a time. Set aside a day or two a week to get your disputes written and then once they are sent off, it will only take about an hour after that. 1• Get and Review your credit reports - Annualcreditreport.com is the ONLY one you can get for free on a yearly basis as required by the federal government. The only other way to get your reports for free any other time during the year is if you have been declined for credit or received a negative report to your credit report. 2• Analyze your report - Most reports have your information listed in a way that separates your good information from your damaging information. But what you are looking for are inaccuracies such as late payments that you know you paid on time for, a much higher high balance than you have spent on a card or collection accounts that don't say paid when you have already worked with the company. 3• List of negatives by importance - These are the items that are most damaging with the top being the worst and the bottom being items you will work on last. Also if you find negatives on your report that you haven't been notified about those companies are in violation of the Fair Credit Reporting Act. You can use this to pressure the original creditor to remove the listing by reminding them they are in violation of the FCRA by not notifying you. 5• Send the letters - After you write the letters, copy them or save a copy on your computer and mail them off certified or registered mail so that you are notified when they have received the letter. Some people send them off and require the receiver also sign for the letter. This is much more expensive but you now have notice for your records of who signed for it as well as when they received it. 6• Keep records organized - You want to document when you sent the letters, your copies and any responses that you received from the CRA. This documentation is helpful, if in the future, you need to take them to court because the companies violated FCRA. 7• Wait Patiently - Each dispute to a CRA has 30 days to respond to the reason you gave them. They also have to provide proof of the item you have disputed, such as high balance or that the negative is yours. If they do not provide proof in the 30 days, they have to remove the negative from your report. 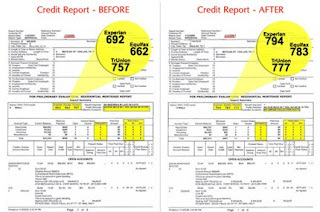 8• Analyze the result - Since you have saved your original credit report that you ordered and disputed from, get another one and compare the two to make sure the CRA has followed through on removing the negative or correcting the error. Pay for delete - debts under $500 can be paid off in return for the entire listing being removed from the report. Settling the debt - debts over $750 can be negotiated down to a manageable lump sum amount to pay and agree to have them remove the item from the report. Debt Validation - involves using the Fair Debt Collection Practices Act in your favor by requiring the collection agency to prove the debt is yours. It involves letter writing to the collection agency, but if the collection agency is non responsive, it requires the threat or filing of a lawsuit. If a negative comes back onto your report and they haven't notified you ahead of time they have violated the FCRA and you can sue them for $1000 and win. But it isn't uncommon for a CRA to remove the item until the items has been verified and then once verified they put it back on, this is fine as long as they notify you in writing before hand. Sometimes, it will just take the mandated 3-10 years, depending on your state, for the negative to fall off the credit report, but you can also dispute the item if it hasn't been removed in an appropriate time. Great article with lts of good pointers and resources (dispute letter templates). As far as I know you cannot remove a bankruptcy, tax lien or judgement from your report. If the lien or judgement items have been paid, you can make sure the report states that. In addition, if you agree to a settlement, any amount that is forgiven over $670 the IRS will consider income and will tax you on it. For example if you owe $4,000 on a credit card and settle for $2,000 the IRS will tax you on the extra $1330 in income. It is pretty rare to get those removed, though I have read on forums of people disputing them before the 7-10 years window and them being pulled off. That IRS forgiven debt as income info is interesting; I will try to track that down on their site unless you have it already? Dawn, It is in the IRS site under debt forgiveness or settlments. The only tine the IRS won't ask for the income tax is if you can prove that you're insolvent with no income source. Thanks for sharing this post. It is really very beneficial for readers. I appreciate this detailed ways for repairing credit score.